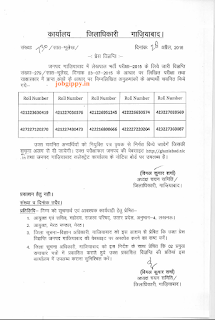 Board of Revenue, Uttar Pradesh had conducted written test for Chakbandi Lekhpal posts on 13 September 2015. Earlier the board had invited applications for which large number candidates applied and appeared for this exam. Candidates can check Lekhpal Final Result 2015 from the direct link given below after declaration. 27.05.2016 : Lekhpal Bharti Court Stay had been cancelled now. All the Remaining districts Final Lekhpal Result and Tahsil Allotment Lists will be announced in upcoming days. राजस्व लेखपाल रिजल्ट : UP Lekhpal Final Result has been announced for Azamgarh, Fatehpur, Amroha, Bhadoi, Itawah, oraiya, Ghaziabad, Jhansi, Lucknow, Hardoi, Mau, Ballia, Sambhal, Mirzapur, Moradabad, Allahabad, Agra, Mathura, Siddharth nagar, SK Nagar, Gonda, Kaushambi, Deoria, Lakhimpur, Kanpur Nagar, Hardoi, Badaun, Lalipur, Bijnor, Shahjahanpur, Firozabad, Farrukhabad, Chandauli, Hathras, Mahoba, Jalaun, Maharajganj, Shamli, Shravasti, GB Nagar, Varanasi, Hamirpur, Sitapur, Raibareli, Mainpuri, Muzaffarnagar, Bulandshahar, Banda, Unnao, Bagpat, Pilibhit, Sambhal, Saharanpur districts. More districts result will be announced in upcoming days. 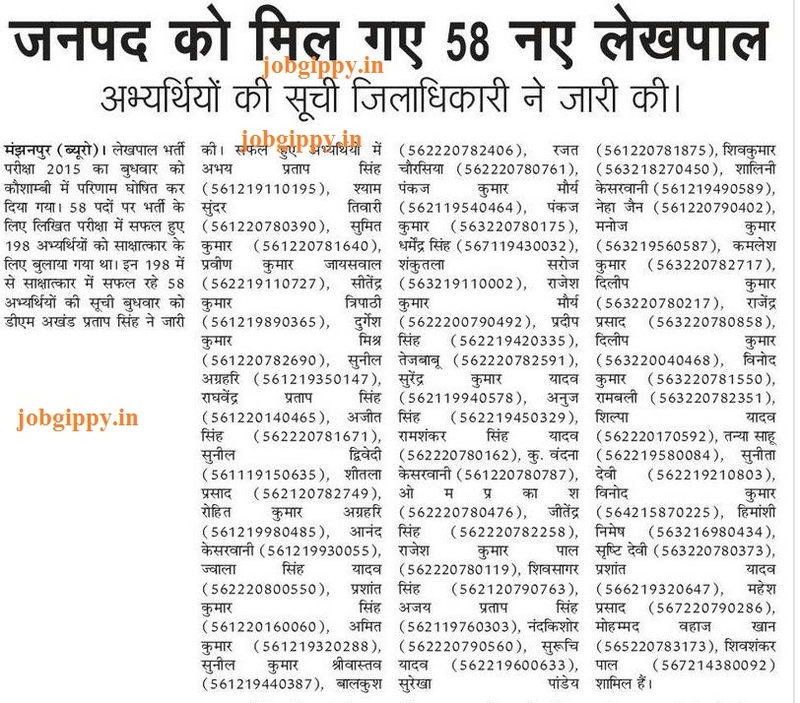 Ghazipur Result will be announced in the next week. Deoria: प्रेस विज्ञप्ति हेतु यहाँ क्लिक करें! चयनित अभ्यर्थियों की सूची हेतु यहाँ क्लिक करें! 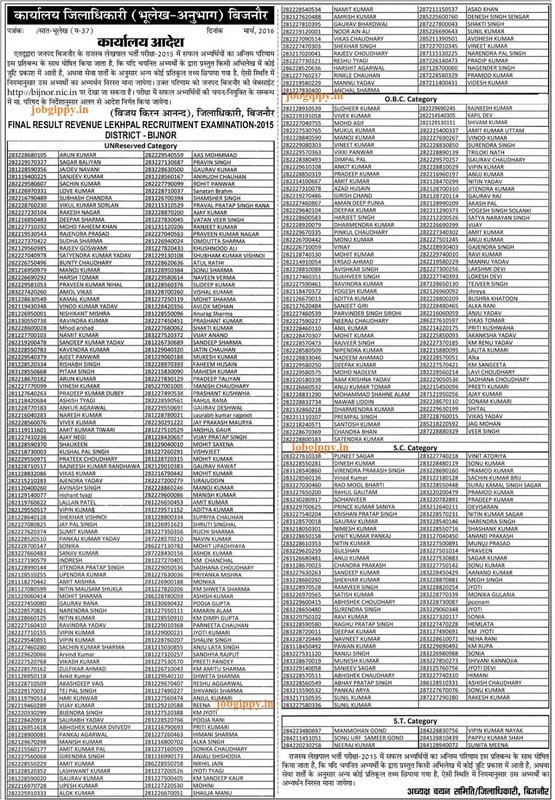 You can also visit the below given UP District NIC website list to find other districts result status. The result is to be uploaded on the district websites. You can check UP District website list from above link to check the result. 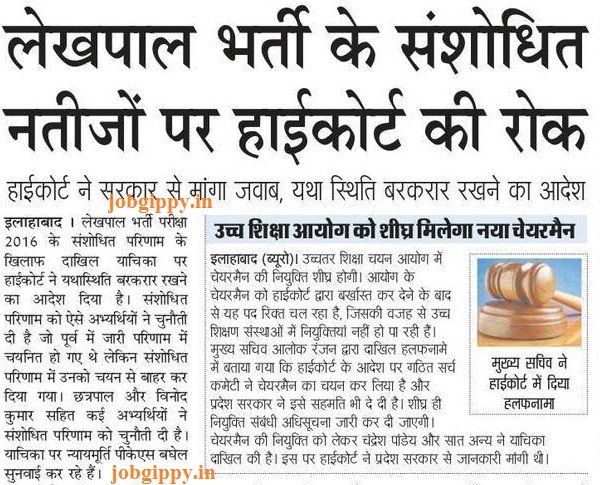 Those candidates who had appeared will be searching to know when will result of Lekhpal got declared. Here is the dates of Lekhpal bharti. Last date for payment of fee: 23 July, 2015. Three times the no. of vacancies i.e. 13600, will be called for next stage. So approx. 40000 candidates will be qualified in the test and they have to appear for interview. After that a district wise merit list will be prepared. Those who qualify the cut off marks will be selected for these posts. Selected candidates would be posted in Pay Scale of 5200-20200 GP 2000. In the written exam of Lekhpal, questions will be asked from subjects like General Knowledge (GK), Mathematics, Hindi & Gram Samaj Vikas. The time given is 2 hours. Questions were asked from 4 sections i.e. General Hindi, Mathematics, GK and Village Society & Development (Gram Samaj Vikas). 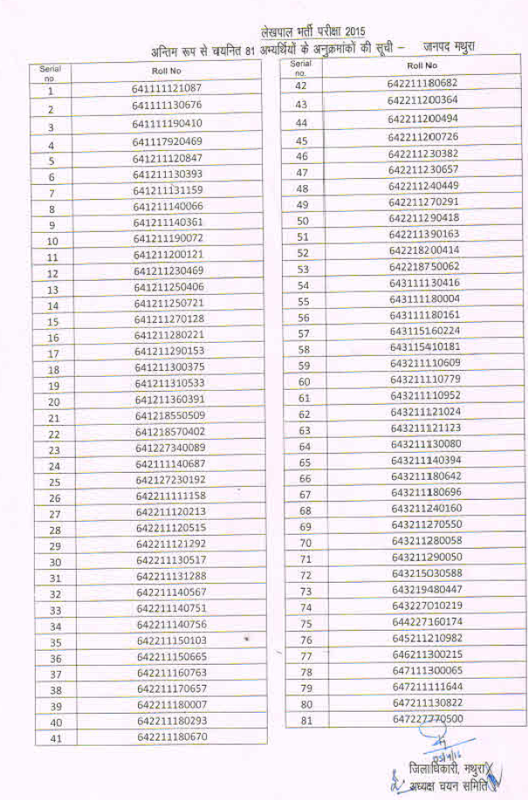 The level of questions asked in Lekhpal exam was of 12th class or equivalent. 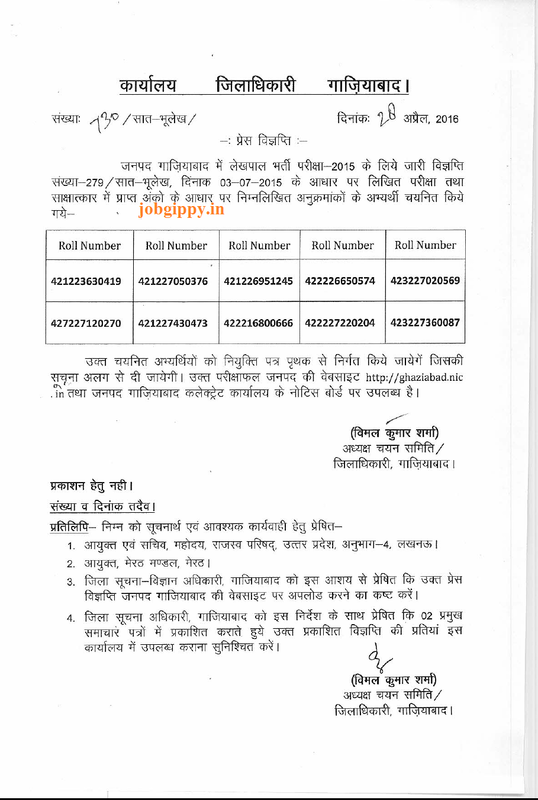 Earlier UP Revenue Department had invited applications for these posts. Candidates had applied for these posts from 22 June to 22 July 2015. To be eligible for these posts, a candidates age should be of 18 year to 40 year as on 1 July 2015. Now the written test had been conducted as a part of selection process. Those who qualify this test, will have to appear for next round i.e. interview. 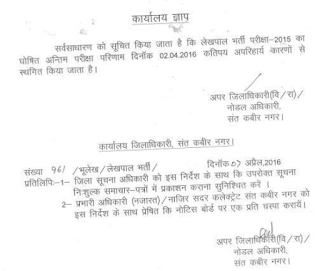 UP Lekhpal exam was held on 08 November 2015 in morning and evening session. This exam was organized in various districts of UP. Lakhs of candidates had appeared for this exam. 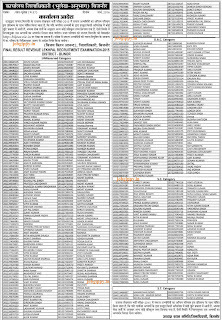 Now answers given by candidates in OMR sheets had been processed. UPSSSC Chakbandi Lekhpal result 2015 can be checked from above link. UPSSSC had organized Lekhpal written examination on 08 November 2015 as per official schedule in two sessions i.e. morning & evening. UPSSSC Chakbandi Lekhpal Written Exam was of 80 Marks. 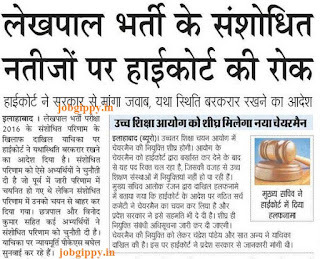 Those who qualify the written exam, will have to appear for interview. 20 Marks for Interview will be of 20 Marks. Selection for Lekhpal / Accountants will be done through a state level examination. For this competitive exam, UPSSSC Lekhpal results will be released by the official website upsssc.gov.in. After that, those qualify written exam, will have to appear for interview which will be of 20 marks. 2. Find the link for downloading result of UPSSSC Lekhpal 2015. 3. 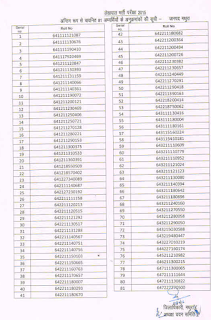 Enter your details and your result / marks will be displayed. 4. 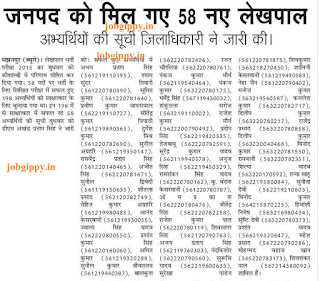 You can check result of UP Lekhpal Exam from there. We will update you via this page as soon as results got released.